These moist and fluffy orange-scented chai spice date muffins made with whole with flour are gently sweet, satisfying and easy to carry around for an on-the-go breakfast or midday snack! 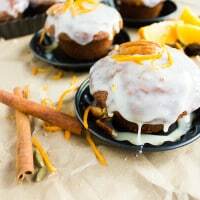 Glaze them with my Orange Cream Cheese Icing for the ultimate fall treat! 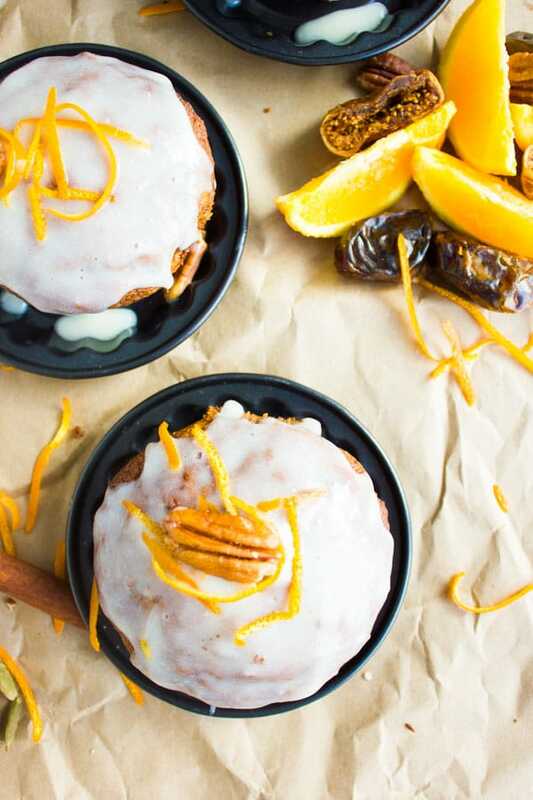 This orange chai spice date muffins recipe is a perfect breakfast treat that’s sweetened with dates and figs, boosted with chai spice and made with whole wheat flour for extra fibre goodness! Whether you’re a chai person or not, you’ll find something to love here. Be it the date sweetness, the orange flavor, or the wholesome nutty earthy taste and fluffy texture! This moist and fluffy chai spice date muffin is my mom’s recipe. Long long ago before chai spice was cool, my mom discovered this Indian spice mix on a trip to Dubai, where she was served a super moist date cake with an intriguing spiciness to it. She asked and asked until she reached the chef who catered the event, he told her about the spice combination he used. At that time, I’m talking about 20 years ago, Chai spice wasn’t quite popular around here. But my mom just loved that date spice cake and insisted on replicating it. And she did. So while my mom preferred this recipe as a bundt cake, I prefer it as small individual muffins. Just makes these Chai Spice Date Muffins easier to transport and the perfect on-the-go breakfast muffin! The only changes I made to mom’s date cake recipe was to use whole wheat flour instead of all-purpose because, aside from the making these healthier and more filling, I find that it compliments the sweetness of the dates and the warming spice mix perfectly. When you make these orange chai spice date muffins with regular all purpose flour, you get a real nice strong smooth date and spice flavor, while the whole wheat flour cuts that down a little while adding a slightly bitter-ish and nutty flavor with a bit of a bite. The other change I made to the recipe was to add a few dried figs and replace some of the dates with them. I feel this adds a bit more character to the smooth date texture, and a slight tang. Now that’s completely optional, and in all honesty, not a huge factor in the final outcome. It’s a slight twist which I think you might enjoy. The beauty of these muffins is they can be made vegan and taste just as delish! Pitted dates and figs are chopped finely and soaked in hot boiling water for a few mins while you prepare the batter. Wet ingredients go in a bowl, dry ingredients in another. The water and date mix all go into the wet ingredients bowl to form a wet batter, which is then mixed with the dry ingredients. Toss in any add-ons you prefer and the batter is done! Scoop it into your lined muffin tins and bake! To glaze or not to glaze? I say GLAZE! 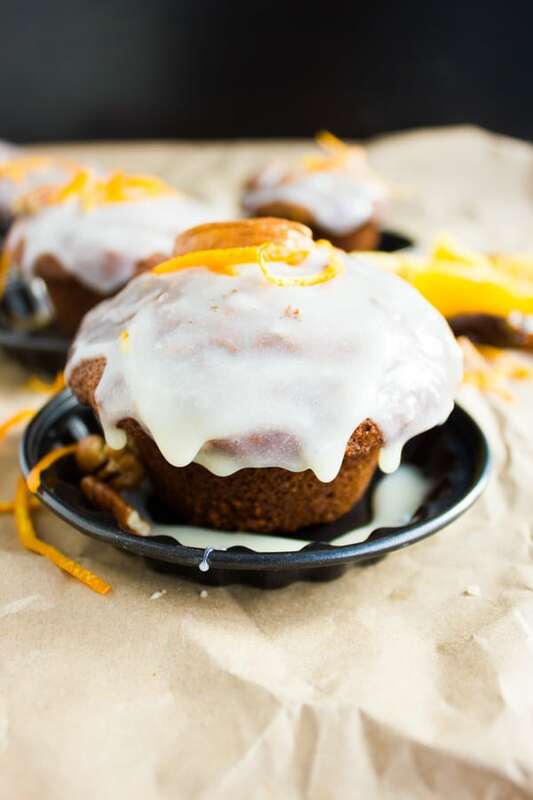 Well, these date muffins are not super sweet, so a nice drizzle of orange cream cheese icing won’t make you feel as guilty as you’d expect and adds a nice sweetness! Don’t worry, the recipe for the icing is so simple and you can just whip it up while the muffins are baking and cooling. 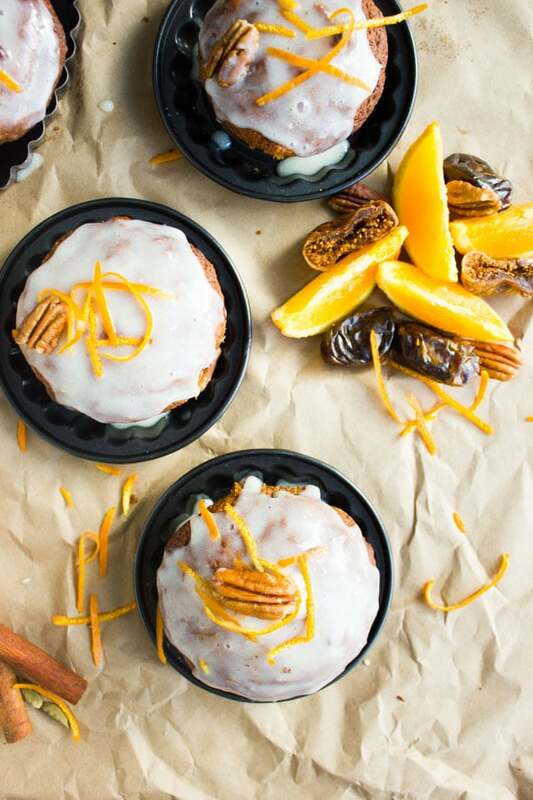 Add nuts and orange, chocolate chips and your favorite add-ons to customize these muffins. Play around with the proportions of figs and dates or swap one for the other. Start testing your muffins after 14 to 15 minutes in the oven to make sure they don’t overbake. Fans of sweet treats with dates cannot miss this irresistibly moist double chocolate date zucchini bread, or this power boosting healthy instant chia chocolate pudding! 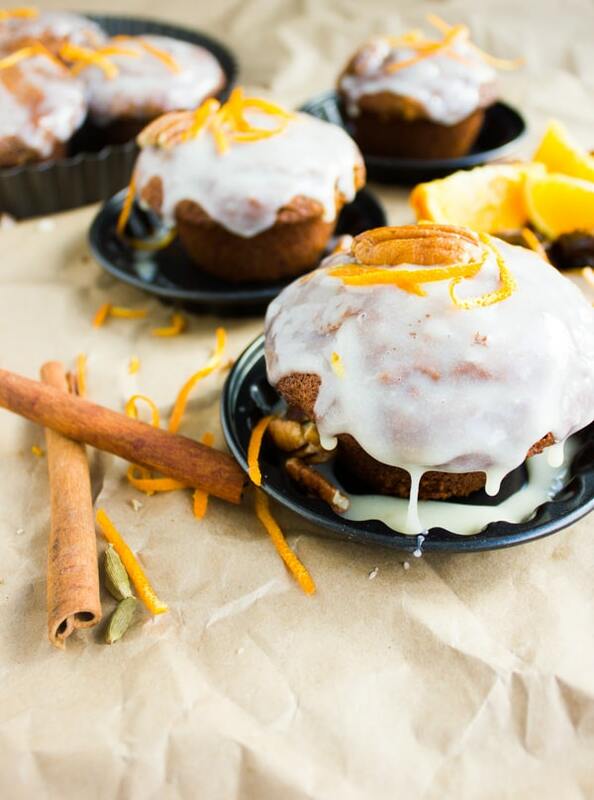 And if you’re crazy about dates and chai spice, well, hello orange chai spice date muffins! If you love baking with whole wheat flour, try this whole wheat banana bread recipe yet? It’s hands down the best banana bread ever! Or these whole wheat apple muffins. Another whole wheat winner that you will love! cream cheese icing with 1 teaspoon of orange zest. Grease a standard size muffin pan and set aside. Put the minced dates and figs (or dates only) in a bowl with the hot water (or juice) and set aside. In a medium-size bowl, whisk the flour, baking powder, baking soda and all the spice until blended. Set aside. In a bigger bowl, add the oil, sugar, egg (or vegan option) and the water-date mixture all at once and whisk to combine. Use a spatula and add the dry mixture into the wet bowl mixture then fold the batter together until just blended and no more streaks of flour appear. Add any extra add-ons and fold them into the batter. Divide the batter among 8 muffin cups and bake for about 15-18 mins until the muffin centers are clean when tested with a toothpick. Let the muffins cool down for 10 mins and then glaze and serve. Start testing your muffins after 14 to 15 minutes in the oven to make sure they don't overbake. These look excellent! I love the combination of flavors you have here and I can see why it became your mom’s specialty. And of course glaze! How can you go wrong? Made this yesterday, so delicious. I soaked the dates ans figs in orange juice. Used egg whites and combination of avocado oil and applesauce to cut fat and calories a bit. Added raisins only. So good! Thank you for this recipe. absolutely worth it to add figs!! You got a few delicious looking frosting drips happening with these muffins! These look so festive and delicious for the holidays! What a yummy muffin recipe! I’m so excited to make these this weekend. Perfect for Sunday brunch! 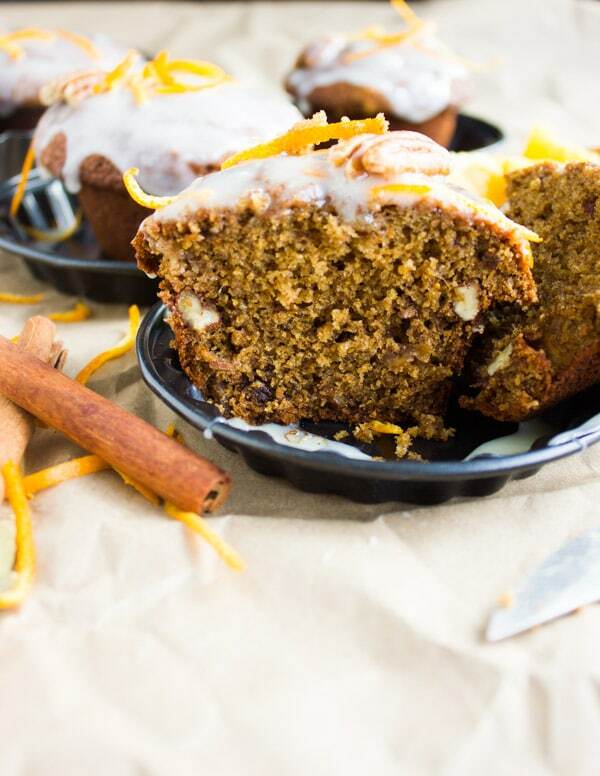 Love all the flavors in that muffin – orange, chai spices and dates — yummy! And the glaze makes it extra special. These muffins make me crazy! I add your recipe to my list favorites recipe. You are a genius and this is the best I’ve ever seen! This is so delicious and it makes my mouth watering! This sounds like the perfect muffin for the holiday brunches. The flavours would be amazing, and I can just imagine the aroma as these bake. Great pairing with my afternoon latte. I am willing to bet that the aroma as the muffins are baking is amazing. The ingredients are all our favorites — the spice date muffins not only would be a welcome treat for breakfast but I’d love to have one in the afternoon with my tea. I am drooling! We are HUGE muffin lovers! I am so excited to make these! I love how packed with flavors these muffins are! Those flavours sound incredible together!!! I love the orange cream cheese icing too, I am a huge cream cheese icing fan so having different variations is lovely. I love anything with chai spice and this has a wonderful blend of spices. Love the addition of orange and whole wheat flour. Sounds yum. I am so excited about this recipe! You know how sometimes you make muffins that look beautiful and are super tasty but then as as soon as you try to get them from Point A to Point B they get messy and ugly so noone really enjoys them? Well, I love to see that these are easy to carry around – just what I need!! Wow these muffins look amazing!! What a delicious treat! I love the spices with the orange…mmm so lovely! 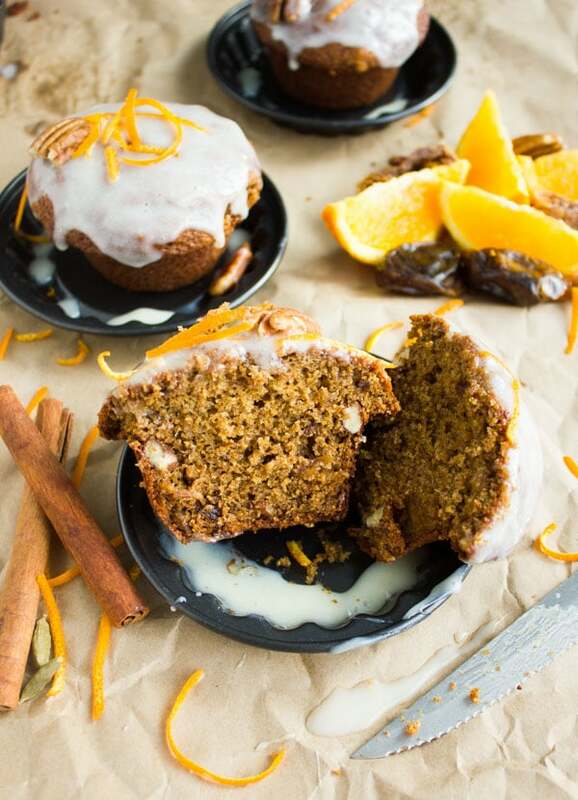 You got my favorite chai spices in this orange date muffins. I love it great addition to festive table. Love it. Wow I love the flavors in these muffins. Spices you used here are one of my favorite. This looks like perfect treat to complement my afternoon tea. I’m so making this. These muffins look fantastic!